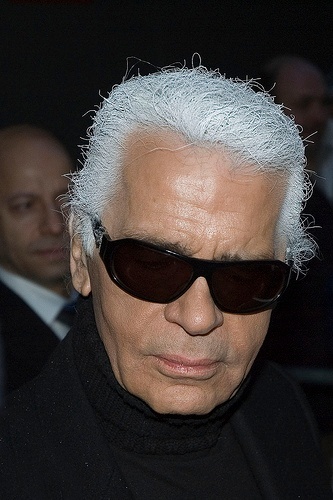 It’s hard to imagine Karl Lagerfeld wearing Flip Flops, a t-shirt and shorts. He’s not only a fashion designer, but a fashion icon himself. Similarly, you wouldn’t expect Matthias Müller, the CEO of Porsche, to cruise around in a run down Trabi. 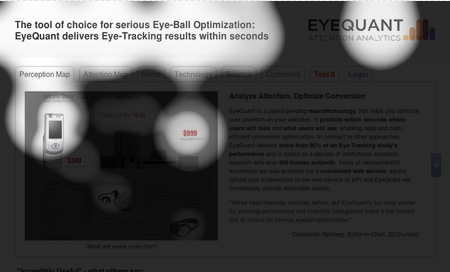 At EyeQuant, we’re building the world’s fastest and most accurate tool to optimise your website’s design – together with some of the most esteemed attention researchers at Caltech, the USC and Stanford. Our big vision is a web where users visit a website and find what they are looking for immediately. Show your users the good stuff right away. Don’t make it just easy to see your headline, benefits and call-to-action: make it inevitable. 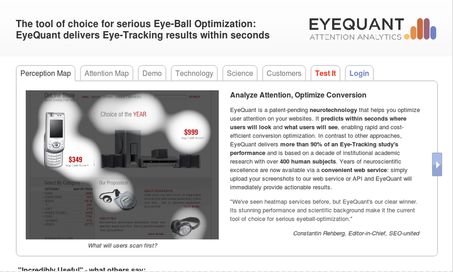 EyeQuant is without a doubt the best and fastest tool for testing and improving this aspect of your design. But our website didn’t look like that. Sure, our users were appreciative about the fact that we’re neuroscientists, not designers. They weren’t buying a beautifully effective store front, but a solution that works. Still, we were embarassed about it. 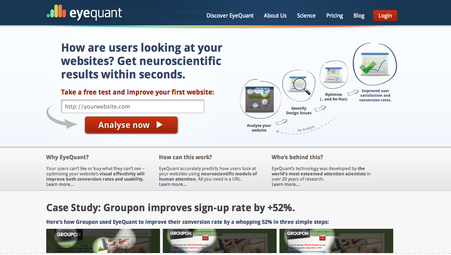 So finally, we redesigned EyeQuant’s website, following our own principles and using our own fantastic tools. Every single one of our customers will know that this is actually a terrible result, since it shows that visitors weren't able to immediately see our call-to-action to take free test. Clearly, this is the most desired action we'd like visitors to take on our website! 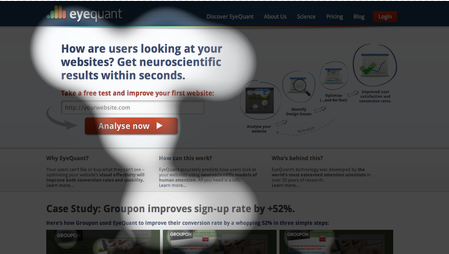 Visitors of the EyeQuant website should immediately understand what service we provide, why they should use it and how they could test it for free immediately. At the same time, visitors should be able to browse a wealth of information - as simple as EyeQuant's value proposition is, the technology is complex and we know that businesses want to understand how something like EyeQuant could possibly work. A clear call for more, and deep, content. +20% is a great result. Mission accomplished. Needless to say, we're very happy with the result of our relauch and hope you are, too. Thoughts and feedback are as always much appreciated. Thanks to Flickr user Siebbi for the cool shot of Karl. Subscribe to EyeQuant Blog by Email!